Engine hours are approximate as owner believes meter does not work properly; 3287 hours showing on meter. New stainless steel heat exhangers and exhaust system - 2014 - both engines. Battery charger: Xantrex 40+True Charge2 Series (New, 8/2017). Batteries: Start - 8D-12VDC wet cell(New - Nov 2017); House - (4) 6VDC wet cell (New - Nov 2017). Alternators: Delco-Remy - both engines. Length overall for moorage purposes: 34'. Waterline Boats / Boatshed did not independently verify capacities or dimensions described in this listing. Information is derived from seller-provided information and/or literature. Beginning in the interior at the bow is the chain locker. The V-berth stateroom is ample for 2; new mattresses as of 2014. The head is ensuite (head, sink and shower) to starboard. Hanging locker to port with storage and drawers below the berth. Two steps lead you to the lower helm and salon area. The galley is to port: sink, a 3 burner Magic Chef stove/oven, undercounter Norcold AC/DC refrigerator, and cupboards. The lower helm station with engine controls, helm seat and electrical panel are to starboard. Just aft is the l-shaped settee with dinette; the settee cushions were recovered in 2014. The cabin companionway is to port just aft of the galley with storage to either side of the entry. Two steps down lead to the aft cabin. A double berth with storage underneath is starboard; the second head with shower and sink is port. A large hanging locker with storage is aft along the port side. Cabin heating is supplied by a Webasto AT b2000 ST forced air furnace and Red Dot engine heat exchange system while underway. A stereo (XD Vision AM-FM) will provide entertainment and ambiance while at anchor or play! On the exterior, there are ample, teak laid deck walkways, teak swim platform on the transom with dinghy and davit system and loads of room for crab pots, oars, dinghy gas, and toys. The flybridge has a hydraulic steering station and propane storage. There is room for kayaks or entertaining on the flybridge and cabin top. Main anchor: CQR - 35#, 5/16 galvanized chain. Second anchor: Danforth; 50' chain, 150' rode (aft locker). Bilge pumps: Rule 2000 - 12 v, automatic/manual, Henderson MKIV manual. Cheoy Lee Trawlers have a reputation for their function and capability. This tri-cabin will be comfortable as a cruiser with family or friends and has space on deck for fishing or crabbing gear or stowing a kayak. Visibility from the lower helm is good due to large windows; the front windows are curved which is a unique detail. This boat is generally in good condition. She has been maintained and used as a family cruiser and enjoyed by many grandchildren. The teak interior throughout is in good condition. The twin Perkins engines make maneuvering easy to control. The full length keel helps to protect the running gear. 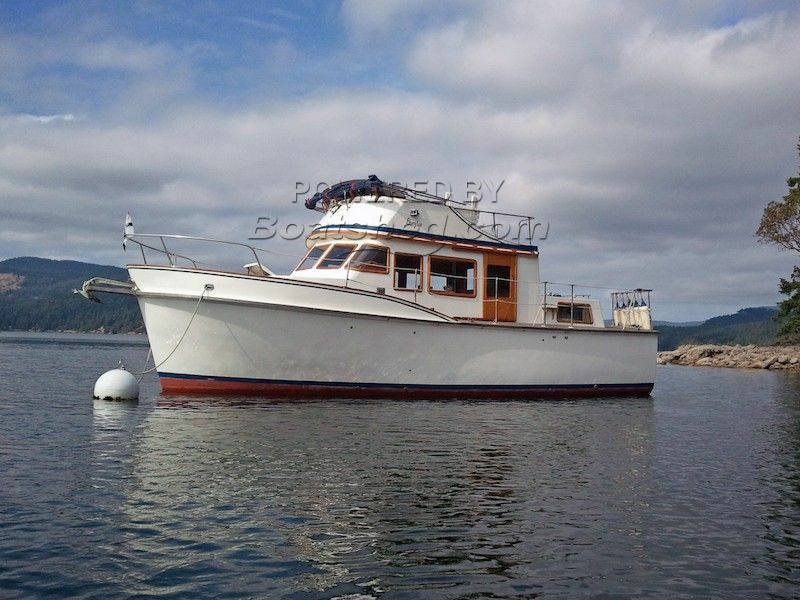 She has a solid fiberglass hull and cabin with teak overlay on the decks and cabin tops. This Cheoy Lee 32 Trawler Tri- Cabin / Twin Perkins has been personally photographed and viewed by Gretchen Miles of Boatshed Everett. Click here for contact details.